For most of my life I knew nothing about motorcycles. Even at 16, when I discovered the independence that comes with driving, I didn’t see the appeal. A car provided the same sense of freedom, I thought, but with the added comforts of a stereo and cup holders. I didn’t know anyone who owned a motorcycle when I was growing up, and they were not a frequent sight around Whitehorse. The Yukon summers provide excessive daylight, but few days to actually enjoy them. When snow can linger in the spring and fall in September, snowmobiles are more practical. With a lack of real-world examples, my assumptions were shaped by movies and television. I believed that motorcycle riders were tough, intimidating, leather-wearing loners. In my mind they were the kind of people who were constantly looking for trouble, using the roar of a motorcycle engine to warn others away. The kind of people I’d be scared to meet in person. For 30 years, on the rare occasions when I thought about motorcycles, it was to think this. Then, on a warm May evening, my partner and I sat on the balcony of our downtown Ottawa condo when he began to reminisce about his old motorcycle. It was the first time it had ever been mentioned and I was shocked. He was the definition of clean-cut and white collar. I had a hard time reconciling my understanding of what a motorcycle rider was with the man who was sitting next to me. Andrew spoke wistfully of his old bike, a Japanese brand, which had been a hand-me-down from his father and his sole mode of transportation in his early 20s. It had gotten him where he needed to go until it broke down and the price to keep it running was too high. It had been nice, he said, but not his dream bike. That was a BMW. “There’s one for sale in Quebec, a few hours away. It’s a little old, but looks to be in pretty good shape. Good price, too.” While this was the first time we’d had this conversation, it was clear that he had been longing for a motorcycle for more than a few hours. “You should get it,” I replied. “Of course. If you want it, you should get it.” He seemed genuinely surprised that I would encourage this so easily, without much discussion or negotiation. I suppose that, just as movies had shaped my understanding of motorcycle culture, they had also perpetuated the stereotype that wives and girlfriends will universally discourage their partners from purchasing large, expensive, dangerous machines. It’s much more likely that they just want to join in the fun. I was also curious to find out why it appealed to him so much. One week later, Andrew picked up his new pride and joy and rode it back to Ottawa through a torrential rainstorm. He arrived home that night cold and soaking wet, but completely exhilarated. The motorcycle, I was sure, had been sparkling when he picked it up, but was covered in a thick layer of mud, almost obscuring the iconic logo. “It’s beautiful, isn’t it?” he asked. Underneath the grime I could see that it was blue. Other than that, I didn’t really understand what I was looking at. The fact that it was a 2009 BMW F800ST didn’t mean much to me. What was beautiful was the smile on his face, which the mud and rain and chills could not diminish. It wasn’t until August that I was able to actually ride on the motorcycle with him. The process of reinstating his license and relearning what was once second nature took three months, most of the summer. But I waited well-prepared; a newly purchased helmet and slightly oversized leather jacket were ready to go in the closet. Sometimes, when he was gone on a Saturday ride, I’d try them on and look in the mirror, wondering if I could pull off the cool, tough, biker chick look. I couldn’t, but honestly, I liked the idea of trying. The first ride was a bit unsteady. I held on a little too tight and breathed a little too infrequently. The cars in the next lane felt too close and traffic seemed to move too fast. As we stopped and started our way out of downtown, I second-guessed myself constantly. Was I leaning too much? Was I not leaning enough? Was I about to send us flying off the Portage Bridge? I had no way of knowing so I stayed as still as I could and hoped for the best. The evening ride was short. The bike carried us higher and higher into the Gatineau Hills, until we arrived at the Champlain Lookout. He pulled over, away from the other cars that had stopped to watch the sun set over the city below. I swung my leg over to dismount, slightly shaky and full of adrenaline, although I tried not to let it show. I could tell from his expression that he wasn’t buying it. “Have fun?” he asked, though his grin let me know he already knew the answer. “Yeah, it was all right.” But I answered with a smile, too. Despite how unsure I had felt on the back of the motorcycle, I had to admit it was thrilling. A little like a roller coaster, and I love roller coasters. Best of all, he suggested we stop for ice cream on our way home. Since then, I’ve learned a few things and slowly my preconceived ideas about motorcycles and motorcycle riders have started to shift. Some lessons have been straightforward: Pack rain gear and be prepared to wear it, no matter how ridiculous you look. Music choice is crucial. The right song blaring in your helmet sets the tone for the whole journey and can make you feel like the star of your own music video. And always, always, mount the bike from the left side, with the kickstand down, unless you want to be trapped beneath 400 pounds of metal. If you’ve learned this the hard way, you’ll never forget. But I also now know that the speed and the wind and the closeness of sharing one seat can soothe sadness and hurt feelings. Sitting on the back of a motorcycle, placing all your trust in someone to steer you safely home again has a way of reminding you that you love them. And provides you with plenty of time to remember all the reasons why. It’s not a cure-all for every disagreement, but it’s a remarkable remedy for finding yourselves on speaking terms again. Maybe the most important lesson, though, is that you really can’t judge a book by its cover – no matter how much leather it wears. Motorcycle riders are not scary, or mean, or unapproachable. 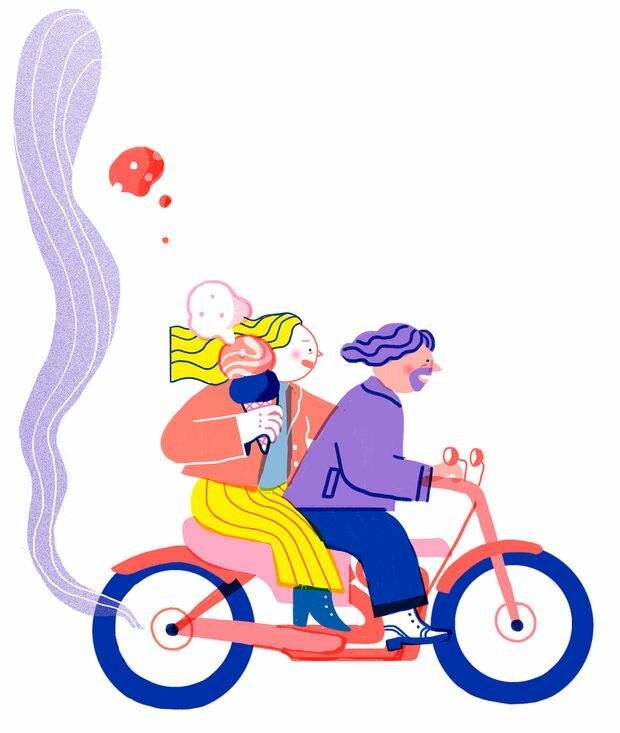 They’re adults who remember the freedom of riding their first bicycle, and are continuously seeking to recreate the experience. Including the ice cream. Most rides end with ice cream. Amanda Keenan lives in Ottawa.